Kids will now be able to engage with their favourite cartoon characters and access new content with 350 new skills. New skills include a quiz from to help expand knowledge of Indian mythology, learning about animal kingdom, solving brain teasers, singing along popular nursery rhymes and listening to stories. Amazon has launched a new category of Alexa skills specifically for children under 13 years of age in India. These skills bring to life popular characters and experiences from renowned Indian and global brands such as Amar Chitra Katha, Tinkle, ChuChu TV, PAC-MAN, Hungama, Appu Series, Videogyan, HooplaKidz, Playablo, Moshi Twilight, and Bob the Train. These skills can be accessed on all Amazon Echo devices as well as the free Alexa app for smartphones. The Alexa India Skills Store currently has over 15,000 skills which serve use cases such as music, news, food, games, smart home and more. 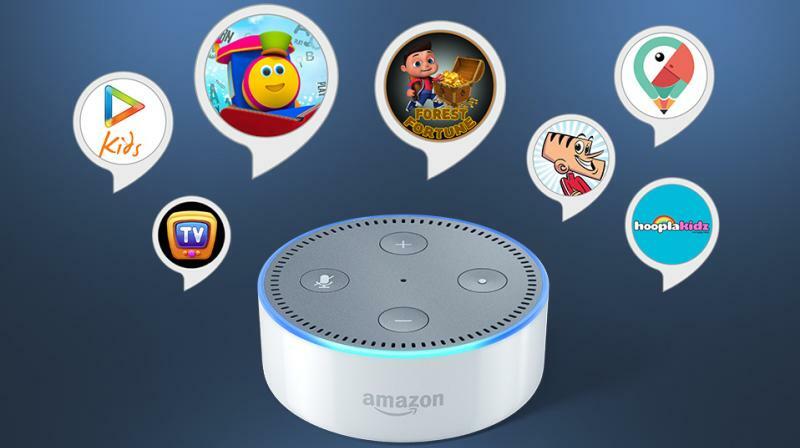 With this new collection of over 350 Alexa skills, kids can challenge themselves with brain teasers and quizzes, listening to nursery rhymes and stories and have fun learning about various topics from wildlife to English, using simple voice commands with Alexa. Parents and families can easily discover kid skills via the Alexa app, or the website, or just by asking “Alexa, what kid skills do you have?”. The ability to use kid skills is controlled by the main account holder and needs to be enabled via the Alexa app. ChuChu TV: One of the world's most-watched kids edutainment channels, brings hundreds of nursery rhymes, stories, songs on colours and animals for kids to Alexa. Just say "Alexa, open ChuChu TV" or “Alexa, ask ChuChu TV to play animal songs”. Appu's Adventure: Based on themes and rhymes from Appu's world, this interactive skill is designed to help develop and improvise listening, comprehending and problem-solving abilities in children. Just say “Alexa, open Appu's Adventures ". Hungama Rhymes: Kids can explore audio rhymes on the animal kingdom, festivals, educational and fun rhymes from Hungama and Appu Series. Just say “Alexa, open Hungama Rhymes”. HooplaKidz: The skill makes learning with songs and rhymes interactive, fun and refreshing with its karaoke and quiz. Just say “Alexa, open HooplaKidz”. Bob the Train: Bob the Train comes alive to talk, sing, tell stories and interact with kids like a friend. At the end of every song, Alexa will ask a question which kids can answer. Just say "Alexa, open Bob the Train”. Amar Chitra Katha’s India Quiz: India's favourite storyteller has put together this fantastic quiz that will help kids expand their knowledge of Indian mythology; from gods to kings. Just say, “Alexa, open Amar Chitra Katha Quiz” or “Alexa, open ACK Quiz”. Suppandi’s Crazy Brain Teasers: Tinkle's favourite simpleton is here to rack your brains with clever riddles that are way too smart for him. Help him out with these wacky questions and exercise your brain muscles as well. Just say, “Alexa, open Suppandi Quiz”. Would You Rather Family: Answer the most ludicrous and silly questions ever created for kids in this Alexa skill. Kids can play alone or with friends and family and burst out in laughter over their answers. Just say, “Alexa, open Would You Rather Family”. Other skills on this theme include Shambu’s Jungle Quiz — popular for helping kids learn all about the animal kingdom, one question at a time, and Beano - popular for ultimate True and False quiz. Forest Fortune: This interactive, pick-a-part story game, will take kids through a royal adventure to hunt for King George’s hidden treasure. Just say “Alexa, open Forest Fortune”. Panda Rescue: Kids get to be the assigned carer of an orphaned baby panda and teach important life lessons by making the right choices as they move through the game. Just say “Alexa, open Panda Rescue”. Playablo: The skill uses gamification to help kids learn English. Just say “Alexa, open Playablo”. Amazon Storytime: This skill offers a growing collection of professionally narrated short stories read by Aidy Bryant (known for her roles on Saturday Night Live) and Tom Kenny (known as the voice of SpongeBob SquarePants). Just say, “Alexa, ask Amazon Storytime to read me a story”. Moshi Twilight: This skill can help settle little listeners at bedtime. It features surreal stories with dreamy melodies and calming narration, guided relaxations and soothing sounds, all with a magical Moshi twist. Just say “Alexa, open Moshi Twilight”.